I’ll be honest – on the Monday after Thanksgiving, you’re lucky to be getting a review. This is the one holiday I refuse to travel across the country for, instead spending it with my husband and some close friends in our own home watching marathons of Buffy and Angel and buying Christmas presents online, and I never have time to read. The only exercise we get for four days is playing DDR on the mats in our living room, and we subsist on milkshakes made out of pie or holiday cookies, so you can imagine that my brain basically reverts to that of a manic, sugar-high twelve-year-old boy’s. I completely lose my ability to concentrate for about a week afterward too, which is unfortunate because the last week of November is always deadline heavy for me. I basically have to tie myself to a chair in a room with no internet to get anything done. It’s not a pretty detox process, and it doesn’t leave a lot of extra energy for books. In fact, it leaves none. So, again, lucky. Lucky that as I was procrastinating cleaning the guest bedroom, I got sidetracked by my collection of children’s books. Of that collection, about half are from my childhood (the ones I’ve managed to beg, borrow or steal from my parents’ sentimental grasp) and the other half are gifts (or gifts to myself) of new, wonderful stories that I’ve shared with students (whose sticky jam hands are never allowed near them). 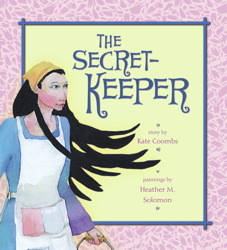 One of my favorites in the second category is a beautiful book with painted illustrations called The Secret-Keeper. I’ve read it dozens of times, and I’ve given it as a gift to the few other people I know who love children’s books as much as I do. It’s such a simple, yet unusual story. I could tell you the whole thing in maybe three sentences, but I don’t want to because I believe the best thing about great children’s books is getting to read them for the first time and discovering how the author and/or illustrator can make magic in just a handful of pages. It’s a unique gift. I’ve tried my hand at it a few times and I am not overstating the case when I say I am terribly unsuited for the task. People seem to think that just because these books are short, anyone can write a good one. That is a misguided notion. I have read a huge number of children’s books – from the wordless, to the rhyming, to the intended for an older audience than they appear – and many of them are tedious, obnoxious, banal…I fear for you parents and teachers out there, because inevitably a child within your keeping will come across a really awful book, and it will become instantly beloved. You will have to read it ad nauseam, and you will understand exactly what I am saying. This is why great children’s books are that much more special. When I was teaching my very youngest students, I read Big Red Barn and Jamberry four or five times a day, and I still enjoyed them every time (impossible to believe, but true). There were…others that I did not care as much for, and the children asked for them just as often (until I hid them and pretended I had no idea where they had gone because I’m a grown up and could do that). They were too young for a book like The Secret-Keeper, but when I worked with the pre-K class, I would bring it in, along with other favorites, and I would have them look through the books and create their own stories based on the illustrations. We would talk about what they saw happening, and sometimes they would ask to hear the story as written, but it didn’t matter whether they wanted to hear the original story or not, because what I loved most was watching them develop their own passion for story-telling. One of the greatest things about children’s books and short stories is that they allow room for us to tell a story of our own, or to at least believe we could if we wanted to. I don’t often get that urge when I read a novel – it’s daunting to imagine creating a whole world with plots and subplots and a cohesive narrative – but when I read something short, it sets off a reaction in my brain that says, “Hey! 300 words? You could do that!” It’s an exciting feeling. It’s an opening for people who have an inkling they might want to be writers but are afraid to start. Will a first picture book or a 10,000 word story be great? Maybe. Probably not. If there’s one thing I’ve learned about writing (and, well, everything), it takes practice. But you don’t have to let anyone read it, if you don’t want to. And if you do want to, well, just imagine that child who loves a story even when her parents can’t see any redeeming value to it, and know that you have an audience out there, somewhere. For more about Kate Coombs, go here. Heather M Solomon doesn’t have a site, but a search will point you toward more lovely illustrations she’s created.